Scientists have discovered Dragonfly 44, a galaxy that is 300 million light years away and has the same mass as the Milky Way. Dragonfly 44’s composition is 99.99 percent dark matter, something that has never been seen in other galaxies. Dark matter is what 27 percent of the universe is made out of, but it has not been officially identified as it cannot interact with light or any other type of electromagnetic radiation. Dragonfly 44 appears to have very few stars even for its size. There are other galaxies composed primarily of dark matter, but until now, all of them turned out to be tiny dwarf galaxies. 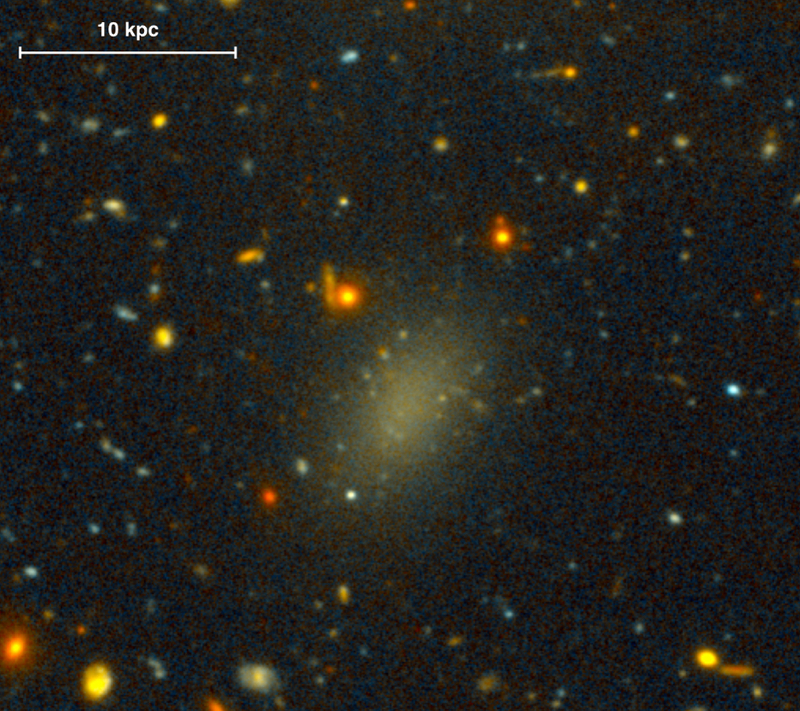 “Dragonfly 44 is very faint for its mass, and consists almost entirely of Dark Matter,” said the Gemini Observatory. Image Credit: Pieter van Dokkum, Roberto Abraham, Gemini Observatory/AURA. The galaxy was found using the Dragonfly Telephoto Array, which is comprised out of 10 Canon lenses which worth $100,000 in total. 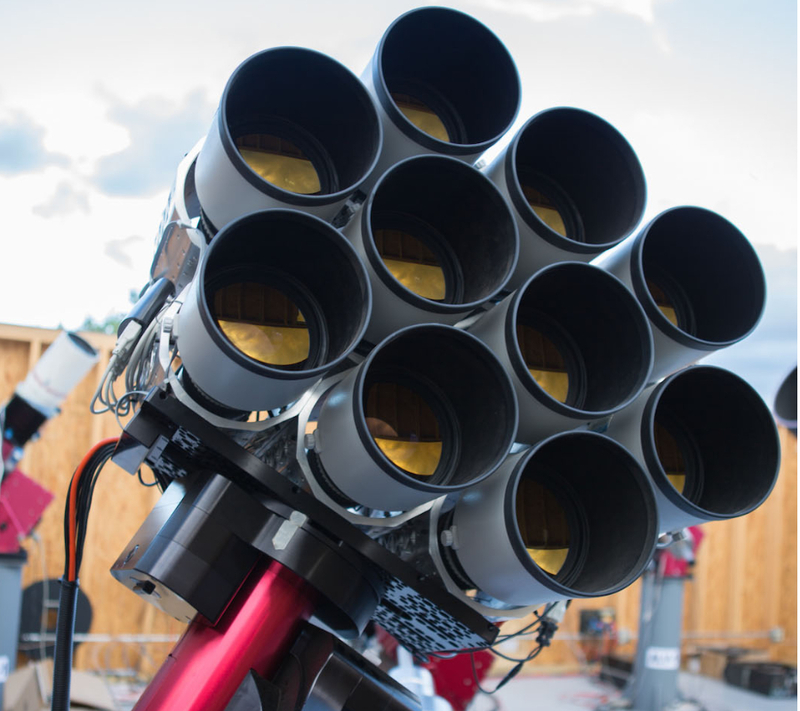 Even if the lenses are publicly available, it allowed the telescope to see things that other telescopes can’t, mainly because of the composition of its glasses that reduces the interference caused by scattered light. The lenses are composed out of microscopic panels, just like a dragonfly’s eye. Dragonfly 44’s discoverers were not looking for a galaxy comprised of dark matter, but instead were trying to study “the outskirts of galaxies to see what exists around them,” which allowed them to see accidentally what at first appeared to be image defects. After being certain that they had found something that they could not explain, the research team led by Pieter van Dokkum from Yale turned to the U.S.’s largest telescope in operation. The research team picked up solid evidence of the Dragonfly 44 for the first time from the WM Keck Observatory in Hawaii. Researchers spent six nights taking photographs of stars in the galaxy, trying to measure their rotation speed. The speed at which a star rotates can be directly correlated to the mass of the galaxy in which it is located. The galaxy appeared to be way too massive for it to remain stable, which is why it was determined that dark matter had to be causing a stabilizing gravitational effect on its contents. Cosmologists have determined that dark matter is everywhere. The ratio of dark matter compared to ordinary matter is of 5 to 1, and this rule appears to be true for every corner in space, going from microwave background signals up to the gravitational ripples of galaxies located light years away from us. Van Dokkum explained that it was as if the Milky Way got 99 of its stars removed while retaining the same mass, which is inexplicable unless dark matter is taken into account. He also stressed the fact that most stars are located in galaxies of Dragonfly 44’s size, and its discovery has shed some new light on the theories that try to correlate the formation of stars and the distribution of dark matter in the universe. “It’s pretty crazy, the difference from the Milky Way is a factor of 100. That’s just something we never knew could happen,” stated van Dokkum.